As a child growing up on classical English literature, I was fascinated by terms like chimneys, fire places, scones, etc, and phrases like ‘lush greenery’, ‘rolling hills’, ‘winding roads’, ‘sparkling water’ and ‘gushing streams’. All of these seemed fantastical until in a clichéd but true manner, travelling broadened my horizon and gave meaning to these fantastical terms. However, it was only last year when I had travelled to the Scottish Highlands that I truly understood where those descriptive terms for nature may have come from. As I shared photographs of my trip on social media and with family, there ensued a discussion about similar places in India. It became a personal quest to visit these places and discover more of #IncredibleIndia. So when summer came in this year, Kerala topped the list of ‘places to travel’ with the quaint Munnar giving a new meaning to ‘rolling hills’ and ‘winding roads’. With a landscape made of lush tea plantations and dense forests, streams flowing down hills and vast water bodies sparkling in the sunlight, you will realise why this region located in the Western Ghats mountain range was deemed the perfect summer town for the British population in pre-Independence India. The ‘perfect’ badge holds true even today, as was evident when my friend Remya and I drove through Munnar situated 5,200 feet above mean sea level. Pleasant climate and picture-perfect landscape being two of the main attractions, I must admit to being surprised by the myriad activities and spots that this town has on offer. But since Remya and I were visiting for just a night, we decided to cover the ‘main things’. And these main things left us stunned to say the least. Having been a frequent visitor to Munnar, Remya had warned me to stay awake – she is well aware of my penchant for falling asleep during car rides that last longer than 30 minutes. “You absolutely CANNOT miss the view,” she kept saying, until a few minutes after leaving Kochi, both of us inadvertently hit the snooze button. Only to be woken up as the driver took to the twists and turns through some dense foliage before I lay my eyes on one of the most magnificent range of mountains to my left and a ravine that could inspire masterpieces to my right. “Behold!” was the apt term as our driver slowly climbed the mountains, slowing down to stop at a series of roadside stalls – called thattukada – for a cuppa. We’d reached the spot in the early hours of the day when the stalls were opening and could only serve us biscuits and black kapi. “But later in the day, you can get piping hot savouries that are made right here,” my travelling companions informed me. Piping hot kattan kaapi (black coffee) that welcomed us. ‘Waterfalls’ when you visit off-season. Eyes sweeping over the panoramic view, I spotted white trails going down the sides of the mountains. These, the driver informed me, were where the waterfalls gushed down from but had tragically dried up during winter. So for those planning to visit, do plan a trip in or after monsoon. On the brighter side, the vista of tea plantations as you inch closer to the city is what makes the journey to, what many called, ‘Kashmir of Southern India’ a divine experience. You will be tempted to stop every few minutes to grab a photograph or two but be practical please. These mountain roads are not meant for photo stops. And pray how are you going to jostle for space with honeymooners posing for photographs with those massive tea baskets on their heads? 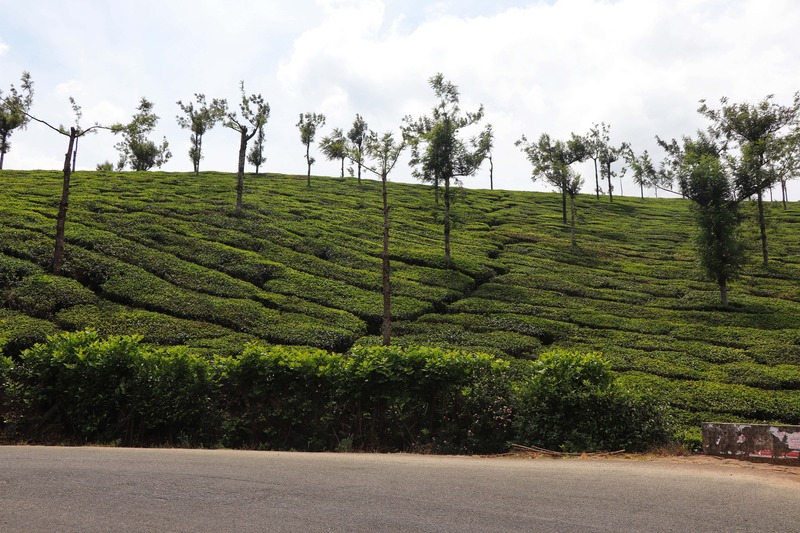 The ride, ladies and gentlemen, is the highlight of your trip to Munnar irrespective of the time you visit it. Forgive me if I don’t behave as per the accepted norm of adult behaviour but how can you miss out a ride on elephants! Oh yes! The second most ridiculously fun part of our trip to Munnar was an elephant ride in the Carmelagiri Elephant Park. We were not prepared for the ride. Remya had forgotten about it and I had been caught unaware. So when our driver – probably in desperate need for a break from two giggling women – pointed out this park’s entrance and insisted we check it out, we shrugged and nodded a yes. Depending on the season, you need to hold on for about an hour or perhaps more to be able to get your turn. But we were apparently visiting in the ‘off peak’ season so needed to wait for only 20 minutes. Our ride for the day was Miss Julie – a young adult who seemed to be my kind! “Who cares if they tell me to run? I am going to walk!” seemed to be her motto. Until it came to slopes along the path where she would do the silent squeal and go “A slope! I want to run down!” For all the laughter it elicited from Remya and me, my delight was punctuated with embarrassing squeals as my tummy rolled over during that jog. This is also your perfect chance to feel like a celebrity and be papped! The photographer would pop out from between the trees to click photographs – blame the prominent double chins on that – and would insist we do ‘the Titanic pose’ or ‘Shah Rukh Khan pose’. No seriously! Give me a Jack Dawson or His Grace Leopold Alexis Elijah Walker Gareth Thomas Mountbatten, 3rd Duke of Albany, and I will do the Titanic. And by the way, only SRK can pull off his pose on an elephant! Nevertheless, these were a few minutes well spent and well worth the amount. Feast your eyes on these few things Munnar until next Monday when I’ll share some more ‘things to do’. Until then, do share your thoughts and experiences in the comments section below, follow us on Facebook/Instagram and give From The Corner Table some love.